Vampires are rarely the gangly, spindly creatures of yesteryear. The cartography of the German vampire’s gaunt, drawn face has been replaced with coverall, pulpy gel and a propensity for pomp. And while teen literature is buzzing like a beetle on its back over the empirically salacious versions of the fanged and supernatural, there’s still a market for the spidery and unsightly. While Neil Jordan has historically directed films with aesthetically pleasing vampires, his undead also possess a wily and damning sense of ugliness that perforates their marble visage. The Irish auteur generally prods the tumbling embers and stirs the fire in order to find what creatively satiates him. In Interview With the Vampire, Jordan orchestrated a maudlin tale of wise, sometimes intrepid creatures of the night that cooed and pierced their way into people’s hearts. It had some dime store sensibilities due to its author’s berry cheeked romanticism (sorry Anne Rice), but it wasn’t, when matched against similar vampire tales, a complete hackneyed mess. And while Jordan hasn’t been involved with a picture of the bloodsucking variety for almost twenty years, he seems to pick up where he left off, subjugating his audience to a twirling phantasmagoria of barbed history and fashion. Byzantium – and it’s deliberately neon poster, reminiscent of Gaspar Noe’s Enter the Void – is essentially about a mother and daughter team that siphon human blood in the belly of a ruined hotel. 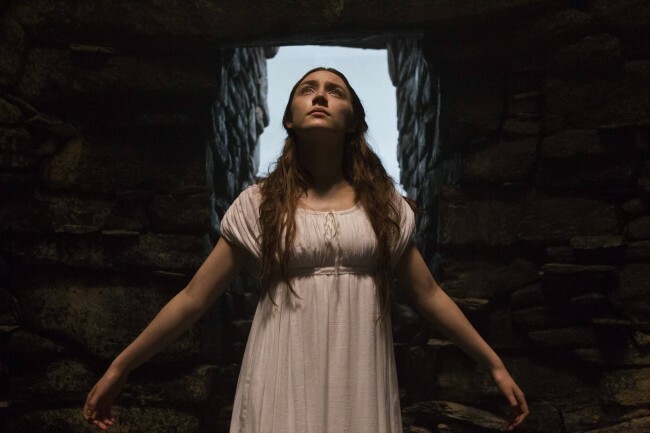 Of course the doting hosts of the building, played here by the generally impeccable Saoirse Ronan and the – um – reliable Gemma Arterton, are the two vampire heroines in question. They splay necks open, relieve their pray of blood, and discard their victims’ bodies like orange rinds. The only problem is that the alleged Gothic, morose, and brooding tone of the film is virtually void of atmosphere. Ronan plays an old soul, trapped in the husk of a young girl, that writes her memoirs with a trembling paw and a sulking heart. “It’s almost as if Mary Shelley and Edgar Allen Poe had a child together,” one character proudly asserts, describing the literary abilities of the aforementioned vampire. Yawn. Groan. Zzzz. If the hokey “misunderstood writer” tableau doesn’t reel you in, perhaps you will find yourself enamored with a love subplot that involves Caleb Landry Jones looking like a Culkin sibling; Sam Riley bobbing his head more ferociously than an ocean buoy; or the myriad of flashbacks that stew in exposition after exposition (a thing this year, from the looks of Man of Steel). Most frustrating is that Neil Jordan, all these years later, has nothing new to say about the evolution or devolution of vampires in today’s society. The screenplay lacks wit or curiosity, and the direction seems more like a plodding, uninterested foray into a host of subjects that seem ripe for the skewing. With Ronan being handcuffed to a story that lets her do little other than look like an inert slab of concrete, there aren’t many reasons to go see this unimaginative exploration into the darkness. It’s not vapid or inundated with a toxic sheen that plagues young adult vampire tales, but it’s also not using its legs to do anything special, which is insulting in its own right.